It's that time of the year where I overdose on all the spring and summer delicacies that have such short seasons. I need to eat it all in as many different ways as possible!! Sweet, juicy strawberries have just started coming out here in Connecticut. I have many plans for them, but I've been enjoying another tasty treat recently - soft shell crab! I love 'em. No fuss, no waste. You just eat the whole little bugger! They're great grilled or fried up by themselves with some coleslaw on the side, but I thought to myself, these would make a mighty good sandwich! 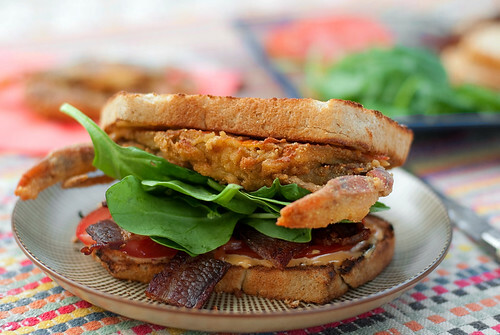 And what could make them better than a bit of bacon and perhaps some ripe tomato, spinach and homemade mayonnaise?? 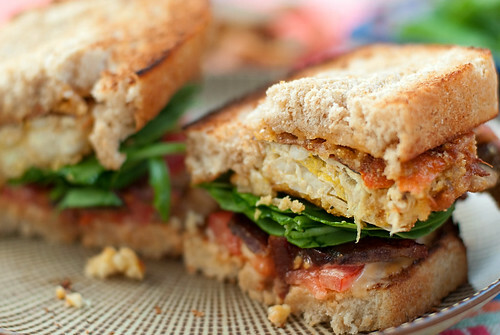 These sandwiches are freakin' awesome. The crabs are crunchy and sweet without being overpowered by the bacon which adds just the right amount of salt and smokiness. The tomato keeps it extra juicy and the spicy mayo adds a little kick. I recommend going for thick slices of a soft, tender bread for these. A chewy or crusty bread would be messy and detract from the fried goodness of the crab. I made a loaf of honey wheat bread the day before (overachiever, what can I say? ), but brioche or a loaf of soft sandwich bread that you can slice thickly from the bakery counter would work perfectly. 1. Whisk together the buttermilk, egg, 1 tsp salt, pepper, paprika and garlic powder in a shallow bowl or small pie pan. Add the crabs. Cover and chill for 30 minutes - 1 hour, turning over once halfway through. 2. Meanwhile, cook your bacon until it's crispy using your preferred method. (I like to bake mine! 400F for 15-25 minutes, depending on how thick it is) Drain and cut into 1 inch pieces and set aside. 3. Start heating enough oil to reach 2 inches deep in a heavy 4 quart pot to 375F. 4. In another shallow dish, whisk together the flour, cornmeal, baking powder and remaining 1 tsp salt. Remove the crabs from the fridge, and working with one crab at a time, let the excess buttermilk mixture drip off then drop into the dry ingredients. Dredge and toss around until fully coated, shake off excess and transfer to a dish while you dredge the rest of the crabs. 5. Fry crabs in the preheated 375F oil 2 at a time, 2-3 minutes per side, or until golden brown. (be careful of spattering oil and water!) The temperature will drop quite a bit between batches, so let it return to 375 for your next batch. Drain on paper towels. Whisk all ingredients in a bowl and chill for 1 hour to let the flavors meld. Oh this looks delicious! 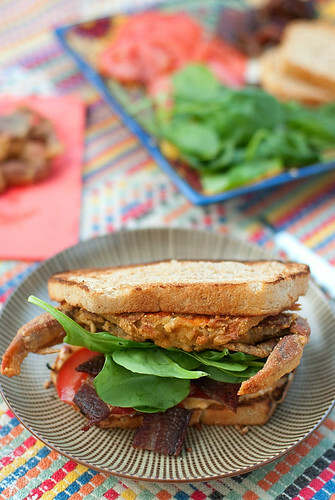 I've been wanting to make soft shelled crab sandwiches for a while, and I think you just inspired me to actually do it! I've never attempted soft-shell crabs before but may just have too now. This looks delicious!